Forages are utilized in different ways and to different extents in the following systems. Forages play an important role in dairy systems because dairy cows need a lot of nutrients in order to produce large quantities of milk. The milk production is also easily affected by changes in nutrient intake. This is not as acute in wool and meat production. Forage quality is important but quantity is also important for high-level production since the farmer already has the cows, their shelter, and other fixed costs. More feed will directly yield more milk without increasing the number of cows, improved shelter, or other fixed costs. Currently in this country, high-energy concentrates are inexpensive and used to increase milk production. However, if grains and other components of feed rations become expensive, dairy farmers would utilize forages to a greater extent. Dairy farmers need to carefully determine the nutritional requirements of the various animals and match that with the forage supply. Dairy production is a yearl-long process so the forage supply and quality must be constant. Dairy systems require the most monitoring of diet and the best planning for weather or storage problems. They need an adequate supply of high-quality forage. 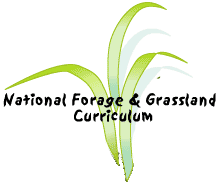 Conserved forages are often of average quality and must be supplemented or used for dry cows or replacement heifers. Farmers and ranchers producing beef usually work one of three situations: cow-calf, stockers (yearlings), or finished cattle. But in all three situations there is less need for constant high-quality forage than dairy operations. The emphasis is placed on matching the supply of high-quality forages with stages of growth requiring high nutrients. When raising a cow to be slaughtered for beef, the young calf and the period just before slaughter require the most nutrients. They need a lot of high-quality forage. Besides these two stages, the cow between calving and breeding needs good forage to build good health. In cow-calf operations cow health must be maintained in order to continue healthy offspring. The calves must be well-fed in yield high-quality beef. At around four months of age calves begin to utilize forage for greater and greater amounts of their nutrition. Cows are not required to supply as much milk so their forage needs drop. This is one of the shifts that occur in cow-calf operations. Since there are times when nutritional needs are not as demanding, grazing serves a vital role in these operations. Pastures of perennial grasses and legumes, usually warm and cool season varieties are well utilized. Excess forages from pastures can be harvested and stored as hay or silage for winter feed. When grazing is available for much of the year, some feed is purchased and harvesting costs are avoided. Since there are times when some of the animals have low nutritional needs, annual miscellaneous forages can serve a role. First-last grazing and creep grazing are often implemented. Again these are used to match the nutritional needs with the available forage. Breeding and calving season are often designed to allow better matching of nutrition to forage supplies. Stocker operations, otherwise called yearling operations, require a use of forages to meet weight gain goals at a specific time. Weight gain cannot occur without a proper schedule or the gain will be fat deposits. These operations require many calculations to meet weight gain goals. Grazing is often the best way to gain properly in this situation and utilizing stored feed is minimized. The exercise and movement of the grazing animal is beneficial. Perennial forages are often used with supplemental overseeding of annuals to provide extensive grazing opportunities. Stocker operators need to understand nutrient needs and grass regrowth mechanisms to facilitate the process. Finishing systems aim to prepare cattle for slaughter. Because of the demand for certain tastes, textures, and physical characteristics by the American public finishing programs need to be planned. Finishing programs may use all grazed forage, some grain supplements, short-term high-energy silage, or feedlot rations. While the public wants a certain look, taste, and texture, there have been concerns presented for less fat, more humane treatment of animals, and environmentally friendly operations. So the use of grain to finish cattle may lead to more of a forage-fed beef market. But this would require more time in the finishing process. The new regime would require a thorough understanding of forage quality. The attributes of corn and other grains as well as forage grasses and legumes is required. Sheep often utilize forages for most of their growth and production. They efficiently use the grazed forages and are less sensitive to changes. Their breeding and reproduction cycles are shorter and therefore can be more creatively adjusted to utilize forage growth. Lactation is a time for high-quality forages but that heavy lactation lasts only 4 weeks. High-quality forage is not recommended for dry ewes because there is a link with reduced fertility and poor gestation. First-last and creep grazing is well used. Ewes preparing for breeding and lambs need high-quality forages. Sheep operators need to understand the reproductive cycle and how to best utilize forage supplies at various stages. Horses are the other grazing animal most often a part of a livestock system. However, horses are often recreational animals and no production goal is set that requires monitoring of forage supplies. Many have associated Kentucky bluegrass or timothy with horses, but if horses are to be well-maintained, horse owners must look at the nutritional needs of horses and match the appropriate forage species. Horses are large animals and selectively choose their food because of their two sets of teeth and agile lips. Grazing can be very productive and beneficial when trampling, pugging, and selectivity are well understood. We may expect horses to supply milk, wool, steaks, or other specific products but their diet is important to long life and good health.